What are the different types of laser printers? Considering which new laser printer to buy is a huge task. There are many manufacturers and many features to consider. Making it particularly difficult is the combinations of features included as standard in the latest models. At first glance, they all look pretty much the same. But, there are some key points which will help to weed out which ones might be keepers and which not. 1. The laser light alters the electric charge on the surface of the drum. 2. Only the charged areas pick up toner as the drum rolls through the reservoir. 3. Combining heat with pressure, the charged areas on the drum transfer the toner to the paper surface, which creates an image. Several different kinds of laser printers currently exist on the market. The most common, and often the least expensive are standard monochrome. These laser printers use one toner cartridge and print in black and white. Some also will print in shades of gray; called grayscale. Laser printers which print in color use four toner cartridges, which include yellow, blue, magenta and black. These different toner colors are automatically mixed during the printing process to achieve full color prints. 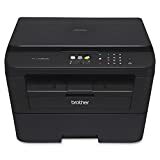 Within both categories of monochrome and color laser printers, there are differences in the print quality, which depends upon how many dots per inch they use to create an image. The higher the dots per inch, the better the quality of print. Dots per inch are called dpi, and they range from a low end of 300 to a high end of 2400. The price of the printer varies based on the dpi and other features. Some non-laser printers, such as LED and LCD printers use arrays of these lights to expose the drum surface and charge it with toner for printing. 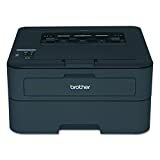 These are often included as laser printers or page printers because they both function like laser printers once their drums are charged. I. Printing capacity — this feature refers to the amount of paper the printer can hold; with input meaning before printing, and output meaning after printing. Refilling the paper tray, and clearing it afterward is time consuming, so higher capacity can make larger offices more efficient. 1. This is calculated based on text, and ranges from approximately 4 to 20 pages per minute. 2. Six pages per minute averages about 40 characters per second. III. Resolution — this feature refers to the measurement called dpi, or dots per inch. Most printers range from 600, 1200, to 2400 dpi. The higher the number, the better image quality for text and graphics. Lower numbers may not be able to print graphics as clearly as higher numbers. V. Paper handling — if the printer has automatic duplex printing, then there is no need for someone to manage the paper so that it can print on both sides, and this is a time and cost saving feature. VII. Memory — laser printers can share over networks because they have their own memory. The memory measurement is in megabytes or MB. MB generally ranges from 2 to 128. The more memory, the more efficient and capable the printer. Higher MB allows for printing larger spreadsheets and PowerPoint presentations; plus faster printing. Home models are now made in compact sizes which fit easily on desks without taking up much space. These are not only less wide, but also less tall, and these two dimensions are important when available space is tight. Determine what the primary use will be, and find the printer which does that the best. For example, general purpose printers will print graphics, photos and text, while special purpose printers may focus on creating labels, printing only photos, or be designed to be portable. Choosing a printer dedicated to a specific purpose will provide the best results for that purpose, but having additional capabilities may be more desirable. Though this P1102W printer only prints in black and white and grayscale, it is efficient and produces many wireless prints. It’s a compact machine, weighing in at 14 pounds and measuring less than 14 inches wide, about 10 inches deep and about 8 inches tall. With an input capacity of close to 160 sheets, it can print up to 19 ppm. It has a monthly printing volume of up to 5,000 pages and enjoys mobile printing capabilities. Its wireless design allows it to print using a tablet or a smartphone. It will print from iPad or an iPhone and can use AirPrint. It will print on letter and legal paper, postcards and No. 10 envelopes and is works well in a home or small office environment. Some owners have had problems with setting up the wireless printing feature. Others have had trouble with the wireless not working properly after it was installed, but those who resourced the latest information about HP printers were able to properly install and use the machines features easily. The SL-M2020W/XAA features silent running, a compact 13.1 by 8.5 by 7-inch size, and a fast printing speed of 21 ppm. It is easy to set up its wireless feature, it is easy to install the toner cartridge, and it makes great prints. Owners have an easy time using the setup CD, instructions and USB cord which comes with the machine to connect with Wi-Fi directly, to facilitate printing directory from a smartphone or tablet. It prints out relatively quickly, with very clear text, but not as good quality for graphics. It ships with a toner cartridge, so it can be set up and start printing right away. It will print on envelopes, cardstock, labels and a wide variety of paper weights. When not in use, it goes into sleep mode to save energy. The HL-3170CDW digital color printer has the Amazon Dash Replenishment feature included. The feature automatically orders toner when the machine is low. Amazon replaces the toner, assuring owners of a steady supply rather than running out at busy times. It must be activated, but it is a nice feature to have. The machine can print to 23 ppm, which is a very fast speed. The machine offers wireless, high quality prints with a dpi at 600 by 2400. The paper try will adjust to accommodate both letter and legal size paper and will hold 250 sheets at a time. It uses 3 color and 1 black toner cartridges, and comes with starter cartridges which have about 2000 to 3000 pages of text life. The automatic toner ordering feature has prompted owners to learn how to reset their toner information so that they get longer life out of each cartridge, and those have been happy with the machine. The HL-L2380DW features a 2.7-inch touchscreen with a color display which helps users to scan and navigate easily. The printer will scan to Dropbox, Evernote, Google Drive, Onenote, Cloud Services and much more. It can connect locally using USB and also allows wired network and wireless printing. Its can print using WiFi Direct, Airprint, Brother iPrint&Scan, Cortado Workplace and Google Cloud Print. It will print professional quality black and white images with 2400 by 600 dpi. It can also enable color scanning with high quality results. This product does well for customers who appreciate an easy set-up process and are pleased with a solid black and white printer. The DCP-L2540DW has great flexibility. It will print multi-page reports, invoices, spreadsheets and many other business documents easily and quickly. That’s due to its excellent 30 ppm printing speed. The copies are clear and readable due to the up to 2400 by 600-dpi resolution. Its wireless networking feature is easy to install, and its connectivity with mobile devices makes it perfect for a small or home office which frequently duplicates and digitizes documents. The HL-L2340DW is a very popular printer with several nice features to make printing easy. It has a relatively fast printing speed of 27 ppm. It will also print from mobile devices and provides automatic duplex printing. The built-in wireless feature allows convenient networking. It uses high yield toner cartridges which help to keep costs contained and will print with a 2400 by 600 dpi quality resolution level. The printer is designed for home and small office users who want a smaller sized printer which will print documents of professional quality. It is reliable, low cost, and fast, with multiple connectivity possibilities. The LCD display and easy to use control panel are a plus. The easy to read 16-character LCD display make browsing the menu simple. High volume printing at a reasonable price. The printer stops printing when it decides the toner needs replacing, so owners must circumvent this action by turning on the Continue Mode while the toner cartridge is fairly new. Difficult to set up to print with a Mac. The MFCL2700DW offers both color and black and white scanning. Its primary goal is to provide high quality printing output at a low cost for both home and small offices. It is small enough to find a home on a smaller desk, yet it will print professionally at resolutions up to 2400 by 600 dpi. It will scan and fax from its scan glass or its automatic document feeder, so sharing, duplicating and digitizing business documents is facilitated. It will print at a fast 27 ppm and it features automatic duplex printing. It features straight forward set up and reliable connectivity with both Wi-Fi and Ethernet cable networks. Its mobile app works well with tablets. It will scan in color, which makes its ID card scanning feature a plus. Scans in color even though it doesn’t print in color. Brother software walks customers though wireless set-up easily. Duplex scanning must be done manually. The Wi-Fi connection is not consistent, so it must be rebooted and reset often. Its Deep Sleep function keeps it from working quickly when left without work for a long time. The 6027/NI WorkCentre offers plenty of options for small office printing. It features an 18-ppm black and white and color print speed, and will produce color prints in 13 seconds or less. Its resolutions are very good, with copies at 600 by 600 dpi and prints at 1200 by 2400 dpi. Wi-Fi is built in, and the product includes documentation, a USB cable, a toner cartridge, and a power cable. The printer is user friendly, with a large 4.3-inch touchscreen designed to make tasks simple. There is a 525 MHZ processor and standard memory which will handle a day’s workload, including charts, graphics and photos. It is sized to fit anywhere within the office space, using wireless networking for quick work. Accepts third party compatible toner without an error message. Will print photos on plain paper. Will not copy, print or scan two-sided. It is not a compact size. Copy speed for multiple copies is a bit slow. The HL-L2300D will print professional quality black and white images with 2400 by 600 dpi. This resolution produces sharp and clear prints, and the machine has a nice speed of 27 ppm. The machine features automatic duplex printing to avoid extra steps and errors when printing on both sides of the paper. The company offers free support by phone for the machine’s life, and a 1 year warranty. It is a compact machine providing low cost printing suitable for a home office. It will print invoices, multi-page reports, labels, envelopes, spreadsheets and even fabric. The printer is high yield, at about 2,600 pages per toner cartridge, and this keeps the price per page low. It’s also Energy Star Qualified. It’s a reliable and cost-efficient printer. The toner cartridge is inexpensive and replaces very easily. The instructions for set up and operation and very clear. Fast warm-up time before printing. The printer will completely stop functioning when it determines the toner cartridge is too low, though most owners would prefer to use it even if the toner density is not 100%. Wireless feature loses connectivity too frequently for some owners. The M277dw is an all-in-one printer which is Windows 10 compatible. It has mobile printing features which allow for easy printing at the office or away. It produces prints with professional results very quickly. Using the recommended toner cartridges results in peak performance and highest quality during printing. The printer is Windows 10 compatible, and this provides an easy information flow from one device to another. Both wireless and wired capabilities keep data secure and work tasks connected. The color output is excellent. Scan, fax and printing are achieved at impressive speeds. 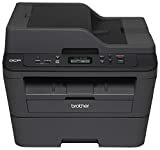 The printer supports wireless printing without needing to connect to an existing network, so mobile printing is very easy. This model will not copy 2-sided originals automatically, they must be copied manually. The scan-to-network folder does not work with MAC; it only works with Windows. From 1972, when Gary Starkweather invented the first laser printer for Xerox, until today, laser printers have come to include a wide array of capabilities. Personal desktop printers using simple and less costly monochrome handle the most common tasks, such as making copies of documents. Color lasers have evolved to the point where they can create images which are high quality and allow for creating brochures, marketing materials, and connecting wirelessly to external devices. 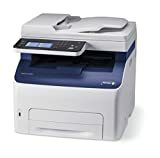 Choosing from the top 10 best home office laser printers is a refined combination of personal preference and printer capabilities. Each home office is a blend of factors including business focus and style. Some offices are complex, with several workers sharing the same space, while others are designed for one person who manages all aspects of the business environment. Thanks to the wide range of laser printers available, there is one to suit each circumstance and price point. 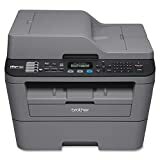 Due to advances in technology, the best laser printers, whether standard size or compact, include many of the features which keep business moving along. These devices are now equipped to be functional within the office space and to connect to the business world outside of the office. Selecting the best one requires making an objective list of which product has the right size, meets the primary purpose, has the best combination of favorite features and is the most cost effective over its intended lifetime of use. With these four objectives decided, the two final considerations are ergonomics and style. Which one is easiest to use? Which one will look the best in its intended space? Once decided; move forward with business.